The long awaited animation Geng: Adventure Begins finally arrives to cinemas. I went to watched it at GSC Pavilion last Sunday. Overall, I would rate the movie 8.0/10. Initially, I’ve already given it 10/10 but somewhere in the middle of the film, the scenes where a giant snake chased the geng were totally unrealistic and skewed the story a little bit, I think. I really love the way they incorporate the Malay, Chinese and Indian cultures into the film. The background color, lighting and the sound effects left me in awe. 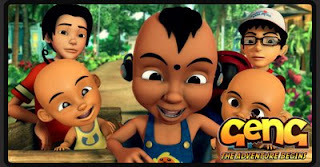 I was just a little unsatisfied because my favorite Upin & Ipin appeared in a few scenes only. I am sure many fans will feel discontent about not seeing Upin & Ipin as the main lead as well. 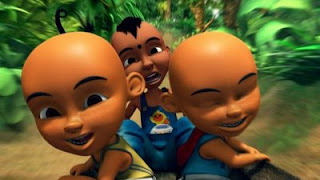 By the way, I felt that Upin & Ipin's skin got darker compare to when they first come out in season1. Don't you think so? However, I’m really impressed with what Malaysians can achieve for their first ever 3D film. They have a great potential to achieve more in the future. Credits: Images taken from Les' Copaque Production Website, Official movie webiste, and their official blog. LOL! Yeah OK, I'll check them out. 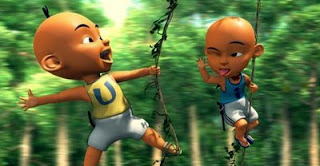 hey.. i already watch upin and ipin.. bcoz of ur promo :) nice!!!! dr-nelly>> wow, it's showing there too? it's worth watching rite? they are really cute! !